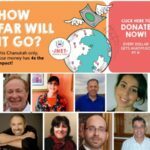 R. Gershon Avtzon helped found JNet.org, a telephone Torah study program that matches individuals with study partners on virtually any Jewish topic. Rabbi Gershon Avtzon and his wife Frumie came to Portland last month to introduce JNet.org to the West Coast. Avtzon helped create the one-on-one telephone Torah study program that attracted more than 200 participants in the first two months of the pilot program. The free program matches individuals with someone of similar age and background who has an expertise in Torah learning. The JNet expert will call the student at a mutually agreed upon time each week and spend a half-hour in chavruta (partner) study on any Jewish topic. With their hand-picked personal Torah trainer, students can learn what they want, when they want and at any pace they want, according to Avtzon. Avtzon, who is one of the program coordinators, said he came to Portland to explain the program because he is familiar with the extensive learning opportunities already available here. Avtzon spent two summers teaching at Chabad’s summer yeshiva in Portland. During those summers, yeshiva students and staff would spend the evenings in partner study with members of the community. Chabad of Oregon Rabbi Moshe Wilhelm said that each student has someone to learn with each night. When the yeshiva ended each summer, Avtzon said that that personal, one-on-one relationship was missing. Praising Wilhelm for the wonderful study opportunities he offers through Chabad classes, the new Jewish Learning Institute and a variety of other programs, Avtzon noted the rabbi is very busy and cannot possibly study one-on-one with everyone who is interested. JNet students can select from a variety of topics suggested on JNet.org or they can come up with their own study topics, said Avtzon. Topics might be practical such as cooking kosher or talking to your children about spirituality or might be more esoteric ideas such as mysticism or tales of the Baal Shem Tov. For more information on participating in a telephone chavruta, call Wilhelm at 503-977-9947 or visit www.JNet.org.